This afternoon, there was an explosion at the Grain Marketing Depot (GMB) Lions Den Depot control tower plant, resulting in a collapse of the tower. This disaster resulted in the plant and one of the silos catching fire and severe damage to the silo’s foundation and escape route which were ripped up and thrown metres away from the storage facility due to the explosion. Three people were rescued, along with one who was affected by carbon monoxide as he attempted to rescue others, but survived after being resuscitated by medical personnel. It is reported that at least four people may have been trapped inside the silo whose valves opened up, causing grain to be released into the tunnel which forms part of the emergency escape routes from the silo. 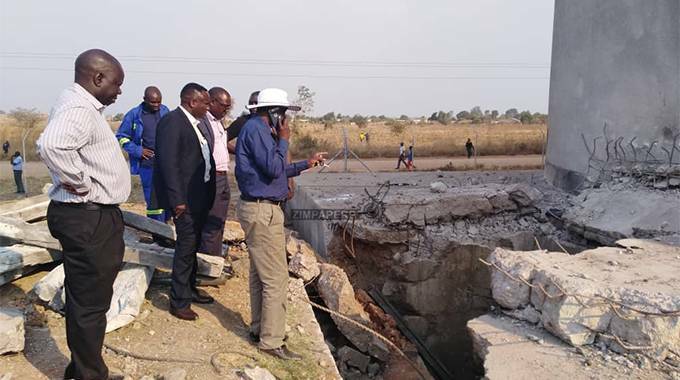 Rtd Air Chief Marshall Perrance Shiri who is the outgoing Minister of Lands, Agriculture and Rural Resettlement,rushed by air to the scene of accident at the Lions Den GMB depot which is Zimbabwe’s largest grain storage facility and considered a national strategic institution.